With less than two weeks away from Christmas 2012 I thought I would suggest a sure fire gift that will go on giving long after the Holiday lights have faded. It is also appropriate for all ages and will equally appeal to all genders. 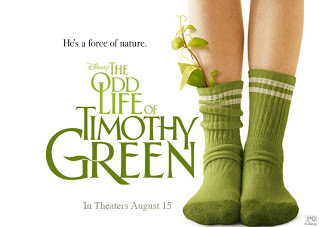 While I first thought Disney’s “Odd Life of Timothy Green” would be too silly or unbelievable to be enjoyed by adults, I was instead pleasantly surprised by the overall artistry of the entire production. From casting to cinematography, from direction to special effects, this 2012 summer sizzler truly was both enchanting and remarkably done. The actors, especially young CJ Adams who played “Timothy” so convincingly portrayed their roles that they made the unbelievable believable. The premise of the film as portrayed in the trailer, led us to believe that this would just be another film by Disney where the parents are stupid, the kids are smart, and the acting would be less than convincing. Instead, director Peter Hedges artfully guides his actors to show so much emotion and meaningful dialog that you are immediately drawn into the story. The story begins as a young couple is informed by their family physician that they cannot conceive children. Later, while sitting down together at home, they attempt to console each other by writing down all the attributes they imagined their child would have had. 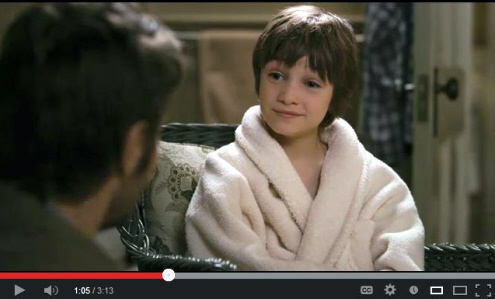 Christian Traeumer and Jay Jay Warren Expanding Acting Careers In LA! While visiting the area in and around Los Angeles this past week, we were thrilled to meet up with two outstanding young actors who are also both amazing dancers and performers. I invited them to meet me at the Hard Rock Café about halfway down the CityWalk to Universal Studios. I of course was celebrating the day at Universal with the prolific young vocalist/performer Sam Santiago and his family during our stay with them in Irvine. The restaurant was empty at the time of our arrival which actually surprised me and the waiter quickly provided a table for our party of Ten. As we all found a seat everyone began to arrive. I walked outside to meet Christian Traeumer and his mother Tomasine who I already knew were delightful people, but meeting them both in person was a true joy! I immediately found Christian to be an effervescent, fun loving, humorous, and bubbly young man demonstrating the kind of personality that lights up a room as soon as he walks in. Since they were the first to arrive I had the opportunity to visit one on one with the both of them before the arrival of our second guests. 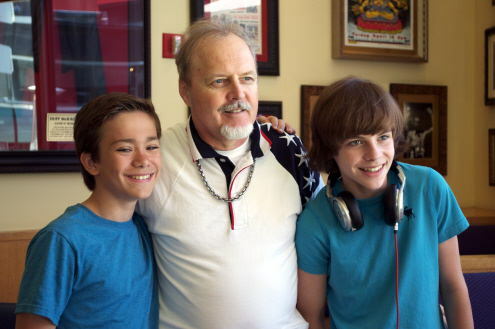 We were just beginning to order when Jay Jay Warren and his mother Beverly walked in. Jay Jay immediacy approached me with an outstretched hand. His warm personality drew everyone to him like a magnet as he walked around the table making self introductions. I found Jay Jay to be full of life and always smiling. In fact, the entire time the joy he expressed on his face made me realize that this young man was on the rise for more reasons than one! His mother Beverly was also amazingly charming so it’s easy to see the apple does not fall far from the tree here.